NEW YORK, NY -- (MARKET WIRE) -- August 30, 2006 -- You've seen them cycling around Manhattan for the past several months and now you can see them at the US Open. The 50-unit fleet of BicyTaxi mobility vehicles are turning heads and changing the face of outdoor advertising -- being utilized for branding and event marketing. Since BicyTaxi came to New York in June, the company has created mobile ads for a growing number of companies and organizations while adding an environmentally-friendly means of transportation for tourists and businesspersons. In addition, this unique transportation fleet is creating a new job network for New Yorkers. TrashTalk! Outdoor (www.trashtalkoutdoor.com), a New York-based company that assists in selling unique and nontraditional outdoor marketing on mobile mediums, has been assisting BicyTaxi in securing advertising among its customer base. Recently the company secured six BicyTaxi vehicles for two weeks during the US Open as a free shuttle service with portable DVD players in the partitions, and soon will deploy additional units for a large national bank to kick off a credit-card campaign targeting college students at 20 Universities across the country. Campaigns for AD Week (September 25 -29 in New York) and other high-profile venues are being executed. "Mobile media offers tremendous exposure on the city streets, whether it's an event-specific promotion or general brand awareness," said Robin Potash, president of TrashTalk! Outdoor. "The BicyTaxi service is new, unique and generating a lot of interest in a very short period of time. It's a great fit to our outdoor vehicle-marketing portfolio." Melissa Garofoli, vice president of Cleveland-based Silver Screen Media, partnered with BicyTaxi to wrap vehicles promoting the need for clean air. Silver Screen Media provides a one-stop shop for movie theatre advertising and promotional trailers. The clean air campaign encouraged observers to visit www.cleanairconservancy.org to learn more about global warming and its negative effects and to gather support for ways to improve our shared environment. The promotion was launched in conjunction with the movie premiere of "An Inconvenient Truth," a documentary produced by Al Gore. 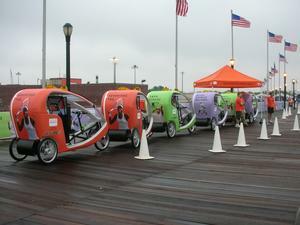 "BicyTaxi and the mobility vehicle concept is highly effective," Garofoli said. "They took our clean air concept and created an advertising wrap that looked great and was designed to drive persons to our client's emissions calculation Web site. With BicyTaxi operating right outside the movie theatre, we received maximum exposure." Steve Blidner, president and co-owner of BicyTaxi U.S., said the "advertising in motion concept" originated in Europe and has spread to more than 35 international locations. Global brands such as Sony, Nike, MasterCard and T-Mobile were among the first to jump on the advertising bandwagon in Germany, Europe, Asia and Australia. Based on the company's immediate success in New York, Blidner said the current 50-unit fleet will grow to 100 units by September. Additional units are available upon demand. "When we first introduced BicyTaxi to the New York market, we knew it would quickly be adopted as a fun mode of transportation," Blidner said. "We expected that advertisers also would jump on the bandwagon, but we underestimated the large interest among event planners. To date, this group has provided the most consistent customer base from an advertising perspective. Our vehicles are already reserved through October. It's a fun, affordable and highly visible way to promote an upcoming event in the city and offer a service to your target audience." Blidner said that he encourages anyone with an upcoming event -- especially those held at the Jacob K. Javitz Convention Center -- to give BicyTaxi a call at least 60 days prior to their event. Advertising wraps can be completed with an approximate 14-day turn-around. A one-time set-up fee of $450 to $990 will be assessed, depending on the extent of the actual ad wrap. Campaign costs will vary depending on the venue, market demand, and the length a promotion is scheduled to run. "With the continued success of BicyTaxi in New York," Blidner said, "we anticipate this advertising in motion service will roll out to other major city-center destinations very soon. Anyone interested in rolling out their campaign via BicyTaxi should give us a call today." For all other queries, visit www.bicytaxi.com or email Steve Blidner at steve@bicytaxi.com. BicyTaxi is a New York-based provider of mobility transportation to the U.S. market. BicyTaxi U.S. is owned and operated by a group of private New York investors with extensive knowledge regarding operations, customer support and the hospitality market. For more information on BicyTaxi, visit www.bicytaxi.com. Six BicyTaxi vehicles equipped with portable <br> DVD players are available during the <br> US Open as a free shuttle service.